"Greetings 2-stroke fans. This will be my second testimony to the prior of 4 years ago. 4 years in..."
Opti-Mizer MAX Pump fits the gallon jug (#60044). Just add 2 pumps per 5 gallons of fuel. 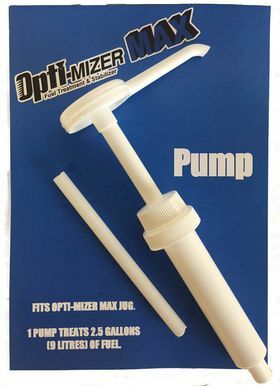 The Opti-Mizer MAX Pump has been tested to over 2000 pumps with no noticeable wear and without losing its prime, even when left idle for 30 days!